MESA, Ariz. - Mesa police are hoping the community can help they locate a young girl who has gone missing. 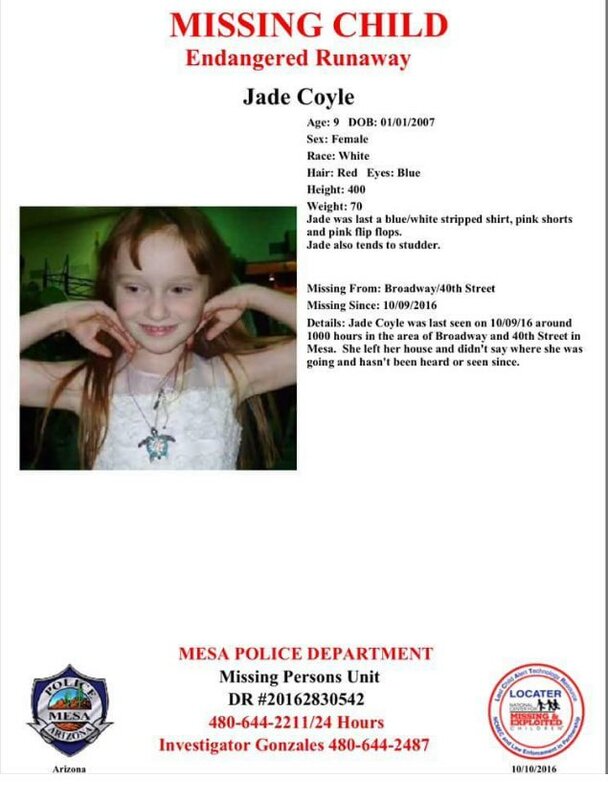 Diana Williams with the Mesa Police Department says 9-year-old Jade Coyle was last seen by family around 10:00 a.m. Sunday near 40th Street and Broadway Road. Williams says Jade left her home and didn’t say where she was going Sunday morning. Mesa police are looking for a missing 9-year-old girl that police are describing as a runaway. Family members reported her missing around 7:30 p.m. Sunday. Investigators are actively searching the area, but if you have any information about Jade’s whereabouts or if you see her, please call 9-1-1 right away. Jade is a Caucasian girl, 4 feet tall, with red hair, blue eyes and weighs 70 pounds. She was last seen wearing a blue and white striped shirt, pink shorts and pink flip flops. She also tends to speak with a stutter, according to officials. MESA, AZ (KPHO/KTVK) - The Mesa Police Department is looking for a missing 9-year-old girl. Jade Coyle was last seen around 10 a.m. on Sunday in the area of 40th Street and Broadway Road. Police said she left her house and didn't say where she was going and hasn't been heard from or seen since. She's an endangered runaway, according to police. Jade is described as white, 4', 70 lbs., has red hair, blue eyes and was last seen wearing a blue and white striped shirt, pink shorts and pink flip-flops. She also tends to stutter, police said. Anyone with information about Jade or where she might is asked to call Mesa police at 480-644-2211. Sunday and hasn't been back since, according to the Mesa Police Department. Police set up a mobile command post next to the neighborhood where Jade lives. Sgt. Diana Williams said Jade has a history of leaving her home, but she does not run away. She generally visits with friends and neighbors. This time she did not come back, and her family called police for help about 7:30 p.m. Sunday. Jade was is about 4 feet tall. She was last wearing a blue-and-white-striped shirt, pink shorts and pink flip flops. Investigators will continue the search Monday morning. Anyone with information on Jade's whereabouts is asked to call Mesa police at 480.644.2011. Timgoy Dak, left, went missing from Phoenix, and Jade Coyle, went missing from Mesa the weekend of Oct. 8, 2016. Two girls from different parts of the Valley who went missing have both been found. Police were looking for Timgoy Dak, 8, of Phoenix and Jade Coyle, 9, of Mesa. The girls were reported missing by their families in separate incidents. Dak was found at an apartment complex Monday not far from her 35th Avenue and Indian School Road home. Authorities said she had last been seen by relatives Saturday around 9:30 a.m.
Coyle, 9, was also found Monday. She had last been seen in Mesa near Broadway Road and 40th Street on Sunday around 10 a.m.
MESA, AZ - Police in Mesa say they've located a 9-year-old girl who went missing around 10 a.m. on Sunday near 40th Street and Broadway Road. Police say Jade Coyle showed up at her home around 10 a.m. Monday. She appears to be in good condition, although police say they do not know where she was for the 24 hours she was gone. Detectives are currently investigating where she was during that time. Stay with ABC15 and ABC15.com for updates.